Go electric’ and solve the emissions problem in your mine with the Tembo 4x4 e-LV, the electric light vehicle developed for mining. It’s a zero emissions vehicle, with low maintenance and operational costs and a reduced need for ventilation in underground mining. The smooth driving experience with instant torque keeps your workforce happy: never before has driving a light mining vehicle been so pleasant. Using the venerable Toyota 70-series & the Toyota Hilux as a base vehicle, the Tembo 4x4 e-LV electric drivetrain replaces the engine, gearbox and all auxiliary parts. Instead of the engine you will find an Electric motor and an Inverter, instead of fuel lines and a diesel tank there are electric connectors and Battery Packs. The new drivetrain is a completely sealed and waterproof package, produced in Europe and designed for use in the toughest conditions. Each part of the Tembo 4x4 e-LV has been selected for durability, easy maintenance and availability: the Tembo 4x4 e-LV uses proven technology from the European automotive sector. With IP67 ingress ratings on vital parts such as the inverter, the EVCU and all electric connections the Tembo 4x4 e-LV can theoretically run under water. Special coatings protect all parts for corrosion, guaranteeing a long lifespan in the toughest conditions. The 95/60 KW E-Drive motor offers 250Nm torque right from the start, regulated by the EVCU for a smooth and predictable ride. 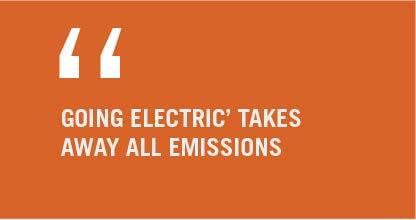 The 100 kW Inverter and the battery pack are engineered to give maximum performance. Bolted directly to the transfer case, the E-Drive motor can handle the entire RPM range from manoeuvring to highway speeds, so no gearbox is needed. With permanent 4WD and a central differential the power goes to both front and rear wheels, minimising strain on the drivetrain. The modular Battery Pack can be mounted under the hood, inside the chassis, on the original fuel tank position or on all three of these places, depending on the range required. Temperature regulation of the battery is vital and a water cooling and heating system is in place for extreme climates and high performance. 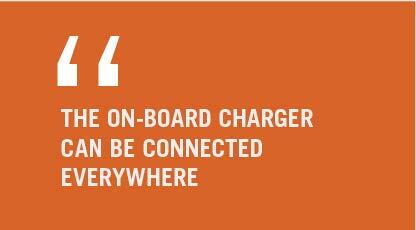 Charging is easy with the on-board charging system. Plug the Tembo 4x4 e-LV into a power socket and it will charge almost everywhere. The charger can be adapted to your electric infrastructure, such as the three-phase 208V up to three-phase 600V standards. 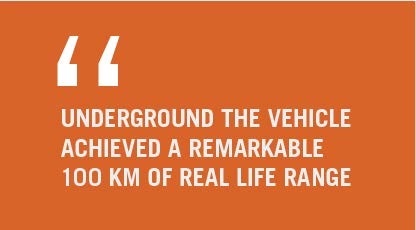 Underground at one of our clients mining-sites the vehicle achieves a remarkable 80-100 km of real life range, including regeneration when going downhill. Driving out of the mineshaft at gradients of 45% proves no problem for the strong motor. Depending on the Battery Pack the Tembo 4x4 e-LV has a minimum range of 50 km off-road and 100 km on-road, with the option to double or triple this distance with bespoke solutions. The Tembo 4x4 e-LV has been designed to be adaptable to different applications, as each mine-site has different requirements. Inside the biggest visible change is the customisable digital dashboard. You only need to look once for all the important information on speed, range and battery life. There is no guesswork involved, everything you need to know is there. Each vehicle can be equipped with a communication unit with access to the EVCU, for tracking, management and maintenance. Together with the dashboard and access control it brings fleet management to a new level. Operational and maintenance costs decrease with the Tembo 4x4 e-LV, as most parts are maintenance free or simply absent. There is no fuel quality to worry about, no gearbox or clutch to be replaced. 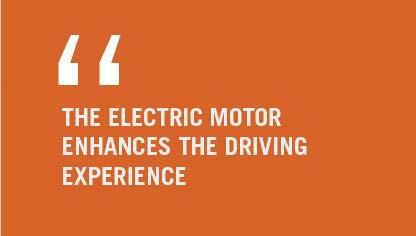 As the EVCU is tuned for smooth power delivery, wear and tear on the drivetrain are minimised. 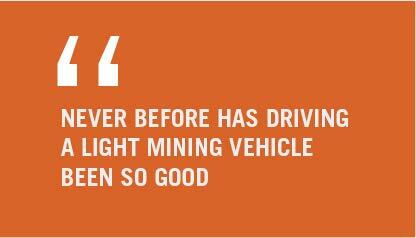 The Tembo 4x4 e-LV is the next step in light vehicle development for mining and industry. It offers an adaptable and well known platform for all light duty operations. At Tembo 4x4 we think of the base vehicle as a starting point for bespoke solutions. With almost 50 years of experience in vehicle conversions we can create the vehicle you need.